We keep seeing a lot of RGB lamps, but they’re also constantly increasing in size and complexity. Take this rendition, which uses a lot of RGB LEDs and has smartphone control (translated). The lamp itself uses 31 RGB LEDs arranged in a sphere that organizes them into three vertical rings. They’re all ganged together (not individually addressable) with one transistor per color. An Arduino board is responsible for control, and the build includes a Bluetooth module for incoming commands. As you can see above, the Android app driving the device is really quite good. In addition to sliders for color mixing there is a separate window with a color picker. 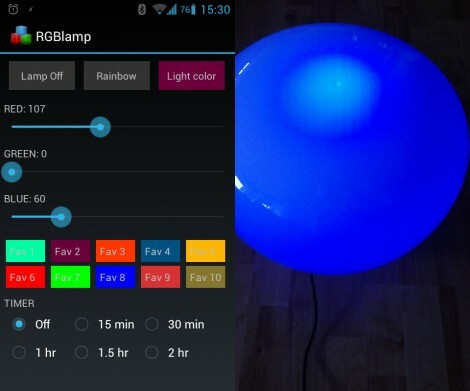 [Remick] included options like favorite color combos, color scrolling, and a timer that will shut the lamp off. We couldn’t embed it here, but you’ll find some demo video at the link above. I don’t like making accounts all around the world specially when the terms and conditions are in A language I can’t read. Real great project, maybe you can host the files on an open download server somewhere ?